The Remote Control Unit (RCU) offers two operation modes- Automatic mode and Manual direction control mode. In Automatic mode, all cleaning parameters can be changed. In Manual direction mode, the Pool Cleaner direction can be controlled manually. This determines the cleaning cycle time. 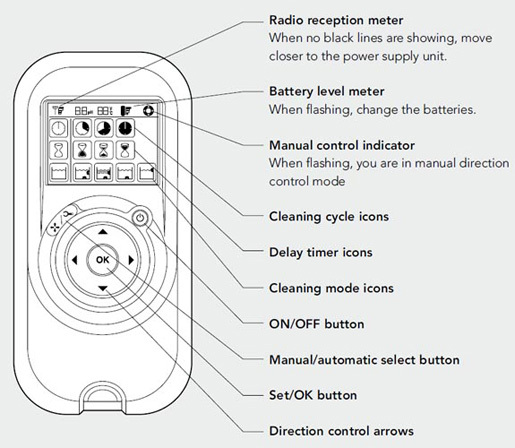 The remote control allows you to choose between the following options. Delay time indicatorThis determines when the pool cleaner starts to work. A delay allows the dirt to settle to the bottom of the pool. Allows you to choose from the following options. After 2 minutes, if no button is pressed, the Remote Control Unit will shut-down and the Pool cleaner will continue to work in the previous settings. When the “Ultra-Clean,” and “Walls Only” options finish their cycles, the RCU will return to default settings. Your family’s pleasure is our family’s passion!